The Flow Detective air sampling pump calibrator has the ability to measure pulsation with a 70-hour battery life and double the duration of competitive products. There is an estimated 18,000 new cases of breathing or lung problems a year caused or made worse by work, and an estimated 12,000 deaths from lung diseases linked to exposure at work.1 It is an employer’s duty to protect the health of employees through health surveillance and exposure monitoring.2 Air sampling is crucial and Casella’s latest Flow Detective is a robust solution allowing air sampling pumps to be calibrated, ensuring the pump has the correct flow, with traceable measurement results. The Flow Detective is an electronic flow meter calibrator, designed to measure the flow of air sampling pumps to within 2% accuracy. 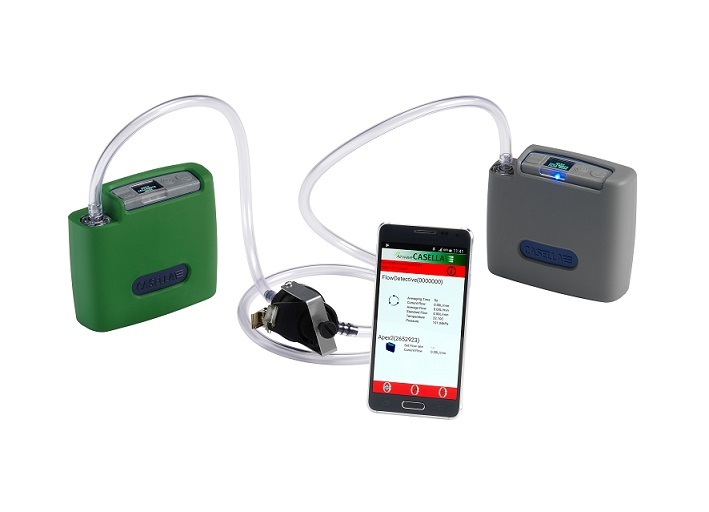 The device has Bluetooth connectivity through Casella’s Airwave App. Airwave provides remote control for dust and noise monitoring devices, enabling calibration results to be sent via email, ensuring improved traceability and pump calibration procedures. As well as detecting air flow, the Flow Detective is the first calibrator with the ability to measure pulsation, indicating if the air flow pulsation exceeds 10 percent. Air sampling pumps must have a pulsation level less than 10% if they are to adhere to ISO 13137. Excessive pulsation means an unsteady flow and has a detrimental effect on the ability of cyclone air samplers to collect the correct fraction of respirable dust.